Anne Morse Hambrock Southeast Wisconsin: Harp For Sale!! This harp was purchased by my mother (a professional harpist) in 2000. It is in fair condition and is being sold as is. I am uncertain when it was last regulated and do not know the age of the existing strings. There are some small areas of damage to the finish - primarily on the back where it will only be seen by the player. Click on the link by the photo of this harp to see pictures that include this damage. Also, unfortunately, the harp has become separated from its original case so the buyer will need to purchase or make a cover for it. (The official Lyon and Healy folk harp carrying case is currently available online for $175.) 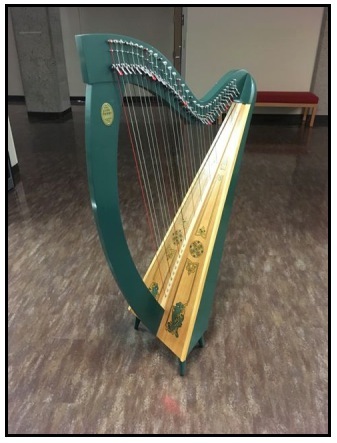 The harp does come with two sets of extra legs - one set is the same height as the legs currently pictured on the harp, the other set is longer. Excellent harp for a beginner looking to get started playing on an instrument with pedal harp tension at an affordable price. Local pick up preferred. If shipping is required all shipping expenses and arrangements will be the responsibility of the buyer.